Recession in an economy is like winter time. Trees are shedding dead leaves. It’s difficult to see a green patch. The well adapted animals have gone into hibernation. The less fortunate ones are braving the chill. If there is anything that’s left smoldering…it’s the question of survival. Survival, is the key theme of this issue of unfair value. On one hand, you would see how investors are losing their precious dollars in an economic activity called trading which produces no value for the economy. You would also see how the corporations have jeopardized their survival in an effort to hedge their risks. The things are quite bad. In India industrial output is shrinking, overall growth his slowing down. The fiscal stimulus provided by government has resulted in record fiscal deficit which is pushing the interest rates higher, nullifying the positive impact of stimulus. Amid all gloom, I’m smelling opportunity. Of making money? Heck, no!The downturn brings an opportunity to learn like never before. All you need is – two open eyes, two open ears, one functioning brain and some free time. If you are planning to stop the business newspaper at your home as a cost cutting measure, don’t. You can stop buying the Times of India instead. The most interesting thing to observe is the change in consumer behavior during uncertain times. The consumers are the intelligent economic agents at the bottom of the economic food chain and thus decide the fate of everyone above. They react to uncertainty about future income by cutting down costs. In each product category, there are multiple price points available. Rather than stopping the consumption altogether, the consumers tend to shift to lower price points. Some producers gain from this downgrading at the expense of others. The producers of goods and services are also intelligent agents. They react to this shift and take actions. Their actions cause further reactions from consumers. The real estate market in Bangalore is an example. When the slowdown hit the real estate sector, the builders were sitting on a huge inventory of homes already built or under construction. They were reluctant to bring down the prices. Why? Let’s say, a buyer has paid only 5 lakh Rupees as booking amount for a flat priced at 80 lakh. If the developer reduces price by 10%, the buyer has an incentive to forego his booking amount and buy another flat at a discount. So the builders kept waiting even though their sales fell, as much as 70% to 80%. The builders were heavily leveraged which reduced their capacity to hold on to prices forever. Then came the wave of new project announcements at the lower end of the market which offered, so called budget housing (whose budget they fit into??). The falling prices of land and construction materials helped. Finally the cookie crumbled. DLF announced a cut in prices in Bangalore. Now guess what would happen next? Amid all this, the myth in the consumers’ mind that the property prices never go down, has been shattered. That’s going to affect the investment demand from wealthy consumers, for the second home that they never needed. And it’s quite easy to see that in a country where 5 lakh per annum is considered a good salary scale, even the so called budget homes are not within the budget of most of the people. At Infosys, less than 0.5% employees earn more than 2 lakh per month. A person earning two lakh per month (gross) will end up with around one lakh rupees per month as the take home salary. If he saves 40,000 rupees a month, the price of 40 lakh for a home represents more than 8 years of his savings. Well, the picture does get gloomy. Talk of real estate makes me feel nauseated. Change of topic. Read this headline. Two are self explanatory…let’s talk about telecom. The Economic Times reports that 99% of new mobile connections in India are pre-paid. This is interesting. From accounting for about 60% of the country’s total subscriber base in 2005, pre-paid users now constitute over 92% of India’s mobile customer base. It’s quite clear that consumers want to put an upper limit on everything that costs money(except stupidity). At the same time, our mobile phone user base is increasingly being dominated by people from the lower income group – which, in my definition includes children of rich dads with zero income. The consumers (or their rich dads who are paying the bill) have strong reasons to cap the expenses but at the same time it is a cost effective and zero default segment for the telecom companies which assures steady minimum revenue. 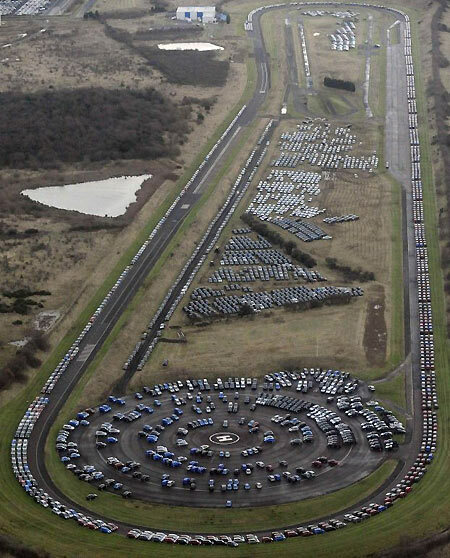 Ok..Look at this picture unsold cars of Nissan stored around the factory's test track. I was very surprised when I saw this. For years, we have been hearing about just-in-time manufacturing by auto companies like Toyota. What happened? The description of their Just-In-Time production system from their site reads: “Making only what is needed, when it is needed, and in the amount needed”. How did they end up with so much inventory? Further search took me to an article titled Toyota, Honda May Scrap `Just-in-Time’ inventory as `Supplier Shock’ Looms. Apparently, when the demand fell and automakers stopped issuing orders to their suppliers for parts, the suppliers were on the verge of bankruptcy. When the demand comes, if you don’t have any suppliers left to supply you the parts, how will you produce the car just in time? The other problem is that of scale. Each model of car requires a certain minimum units to be produced to be profitable. If you are selling 250 units a day, it’s ok to produce 200 units some days and 300 on others, based on variation of demand. But you cannot profitably produce just 10 units a day in your state-of-the- art plant that cost you billions of dollars. You can see the kind of surprises the downturns throw upon us and to the extent we overestimate our capability to comprehend complex symbiotic relationships between economic agents and the shock waves of impact that travel at lightening speeds. I feel humbled by the phenomena that I can not explain or account for. This has always been the driving force being my quest for knowledge. I’ve presented a few cases to you but if you start your day with a warm cup of tea and a business newspaper, you will have more fun and we at UnfairValue will always love to be part of your quest for answers. The value of the art of fishing is always more than the monetary value of the fish that you are offered in all cases expect when the fish you are being offered is the last fish of the once abundant seas. The investing world is swelling with fishes. It’s about time we stop searching for a hot tip about a stock that’s going to shoot through the roof. It’s time to learn fishing. Human beings, in general, and investors in particular, suffer from an innate desire to justify what they did in the past. Harmful as it may be, it helps reduce the guilt and keeps intact our mistaken beliefs about out own competence. Given this background, it may not seem odd to you that last night, instead of completing the Feb issue of Unfair Value, already behind schedule, I was reading an essay called “In praise of idleness” by Bertrand Russell. He recounts a story of the traveler in Naples who saw 12 beggars lying in the sun, and offered a lira to the laziest of them. Eleven of them jumped up to claim it, so he gave it to the twelfth. It occurred to me that Mr. Market also gives the best returns to the laziest of investors. A hyperactive investor produces best results for his broker, his advisors and the revenue department of his country’s government, but not for himself. But I’ve evidence to suggest that an average investor is hyperactive. Half the time he is jumping from one stock to another and in the remaining half he is cursing himself for not having swapped his defensive stock with a commodity stock that just doubled in a month. For such investors, I have a message. If someone who became the world’s richest claims that “lethargy bordering on sloth should remain the cornerstone of an investment style”; you better listen. If you can’t, for god’s sake, stop fretting about missing a golden opportunity to make a quick buck in the market. To understand this let’s merge all listed Indian companies in a company called India Inc. Now, India Inc. has only one share and distributed all its profits as dividends. The turnover percentage suggests that the lone share of India Inc. would have changed hands every year. Based on average market capitalization of the year 2008, the earnings yield of India Inc. was 4.95%. After 14% dividend distribution tax is paid by the company, the investor receives 4.257% as return on his capital. He pays 0.5% to 0.8% of his capital in brokerage, 0.125% in securities transaction tax. I’m not counting the transaction costs on derivative, which will make the equation worse. Last Friday, Feb 20th, the derivative segment turnover was 43,149.65 crores compared to 6,459 crores turnover of the spot market. You see that the investors fritter away a significant percentage of the returns that their company earns for them, as trading costs. If you add the spreads, fund management fees and fees charged by advisory services, we, as investors, are squandering somewhere between 20% to 33% of our profits to these frictional costs. Warren Buffett, in his article in Fortune Magazine in 1999, had reached the same conclusion and estimated the frictional costs to be around 33% of profits from Fortune 500 companies. In India, the short term capital gains are taxed at 15% but there is no tax on long term capital gains. This means an investor who holds his stocks for less than a year has to generate an internal rate of returns 1.18 times higher than the long term investor, to reach the same after tax returns as the long term investor. In the long run, this small advantage helps the tortoises of the investing world to beat the hares. Let’s try to understand the reasons behind the tendency to churn the portfolio. The little speculator lurking within the investors makes them susceptible to follow-the-herd mentality. Every boom is characterized by irrational expectations from few sunshine sectors. In the last boom, people went to crazy heights of stupidity while evaluating sectors like retail, power and real estate. These have always been capital intensive, low margin businesses and will always remain so. In Jan 2008, there was no reason for any investor to buy Pantaloon Retail at 100 times its profits, or Reliance Power at more than one lakh crore Rupees, or DLF at more than 2 lakh crores. However, the investors stood in queues to get a chance to participate in the ‘boom’. Reliance Power was oversubscribed 69 times and DLF 4 times. People in resource starved countries like India love standing in queues. A queue is their ticket to get something that is in demand. One of my friends once told me about a similar incident. After an entertaining evening at a rock show, he was standing in a long queue in front of a mobile toilet. Two guys saw the queue and promptly joined it. After sometime, when they couldn’t figure it out themselves, they asked my friend, “What is this queue for?” The queue of IPO investors is made up of many such people. When the fascination for a specific sector ends in a disaster, the investors rush to the next hottest sector. The stock portfolios that change like the wardrobe of a fashion model, always burn a hole in the pocket. The misguided self belief of investors, in their ability to time their purchases and sales, adds to the churn. Suppose you hold an auto stock that you like but at the same time you believe that in the short term, the auto industry can throw only negative surprises. You would think you can sell the stock now and buy it back later at lower prices. Similarly there are people who know that the real estate stocks don’t make a good investment, will buy them because they have fallen 90% and the government has announced a package for cheap housing loans. They hope to be able to sell for a quick profit. You may get it right once a while but there is enough empirical evidence to suggest that it does not work. In 1975 article, Nobel laureate William Sharpe, demonstrated statistically that in order to benefit from a market timing strategy you had to guess it right 74% of the time. We all have a desire to profit from every opportunity that comes our way. It is not uncommon to find the buyers who, having waited patiently for years, jump as soon as the prices fall. If you ask them the rationale behind buying, they will quote the fall in prices. Let’s say you wanted to buy a house and it was quoting at a million dollars and you find the valuation insane. Then the subprime crash comes and you see the same house selling 20% below that price. Now answer this question. If you did not buy that house at 1 million dollars (or Rupees 5 crores) because you thought it was overpriced, why are you using that million dollar price as a base to say the prices have fallen by 20%? Fallen from where? The calculation must always be based on the worth of the house. A similar fascination among stocks investors, with the 52 week highs, is main cause of their troubles all 52 weeks in a year. There are more ways to make money in equities than you can imagine but most of them are not exciting. It’s no fun waiting in the sidelines for years for a stock and then buying when people around you are losing their job, their home and peace of mind. But one thing is very clear – you are better off with a boring strategy that yields good returns than an exciting, doomed to be short-lived, stint with exotic trading strategies. Once you have the money there are countless ways to buy excitement. It’s a once in a lifetime experience to watch a cheetah cross the speed of 100 km per hour in a mere 3 seconds while chasing a prey. But it could be even more fun to watch the puzzling phenomenon of how animals like the sloth (typical speed 15-30 cm per minute) manage to survive and thrive in the fiercely competitive natural world”. Sloths survive on a diet of leaves which give very little energy or nutrition and do not digest easily. Their digestive process takes almost a month and naturally their undigested food accounts for two thirds of their body weight. They sleep 15 hours a day and their metabolism rate is less than half of that expected for a creature of their size. With the help of their long, curved claws they effortlessly hang upside-down from branches, sometimes even after death. What have sloths done to earn the badge of honour, going by Darwin’s theory of survival of the fittest? Sloths have taken energy conservation to its extreme and turned it into their advantage. The DNA of value investors should match more closely to the DNA of sloths than to cheetahs. They should be omnivorous like sloths (bonds are as good as stocks if they give better returns at lesser risk…Gold? Why not!). They should preserve their capital as scrupulously as sloths preserve their energy. They should chew their thoughts for months and they should remain hanging to their good stocks for life….sometimes even after death. P.S. : Having extolled the virtue of laziness, let me state that I’m not proud of my laziness in spheres other than investing because – in Ben Franklin’s words – to be proud of virtue, is to poison yourself with the antidote. 4. Does Market Timing Work? I’m casually flipping through the pages of Fortune magazine. Right before my eyes is a very interesting company. It is ranked the seventh-largest company in the United States in the Fortune 500 index. It is the most admired company in its sector, number one for "innovativeness" and number 2 for "quality of management”. The magazine features an interview in which an executive of the company is talking about the great revolution in the 21st century, “as big as internet”. It’s the idea of hedging your risk. He is talking about revolutionary hedging products that give you a safety net against the risks inherent in the business. Say you buy crude and process it. By the time you are ready to sell the output, the prices crash. What would you do? You are not here to predict the prices. You are in the business of refining the oil. So you sell contracts for future delivery of your output. The same basic idea, he says, is now being applied to things you couldn’t have imagined. They have derivative products in weather, fiber optic bandwidth, retail gas, power and water systems. Suppose your company makes central heating products. In a particular year, suppose we have unusually warm winter. You have a huge inventory of central heating systems for which there are no buyers. You incur significant losses. One more year like this and you are bankrupt. What do you do now? You can buy a call option on temperature of the next winter(!). If the winter temperatures are above mean, you make money on your call option. If they are low, the money you would make selling the central heating systems will be more than the small price you pay for the call option. I'm amazed! Derivatives on temperature? Wow. Do you believe in global warming? Go for a 100- year call option. When the molten ice from glaciers inundates the low lying great cities of the world, your account will be inundated with money. My copy of that Fortune is still fresh. Enron Corporation, the most admired company in the energy sector, has filed for bankruptcy. I’ve decided against opening a derivative trading account with my broker. I’m fine with the risks that I can measure. No, thank you. In two half pages, Buffett describes the main problems with derivatives, namely – counter party risk, problems in accounting for derivatives (what he calls as Mark-to-Myth accounting), the tendency of derivatives to exacerbate troubles in an already troubled corporation, the daisy-chain link effect where problems of one counterparty can create a chain reaction which can threaten the stability of the entire financial system and finally, the fact that derivatives curtail the ability of regulators to curb leverage. Charlie Munger, adds a timeline to the doomsday prediction. “I'll be amazed if we don't have some kind of significant [derivatives-related] blowup in the next five to ten years." The doomsday arrives. Derivatives deal a deadly blow to the economic system. Once mighty companies, which had seen two world wars and dozens of boom and bust cycles, are left either dead or half dead. Bear Sterns, Lehman Brothers, Merrill Lynch, AIG, WaMu, Wachovia, City…the list keeps getting longer. Back home the news isn’t good either. In September 2008, 165 Indian companies make a provision of Rs 9,815 crore for mark-to-market (MTM) losses on forex loans, receivables or derivatives. Mark to market loss means that the value of the derivative instrument in the market is less than what the company was showing in the books. In the next quarter, a total of 335 firms made MTM provisions of Rs 9,618 crore. To put the loss in perspective, the aggregate profits reported by 2,478 Indian companies, in the same quarter, was 47,706 crore. Imagine losing a fifth of profits to gambling. In a scenario of falling profits, the forex and derivative losses may soon drag the companies into red. The most unfortunate part is that the list of companies which have reported such losses includes companies which are known for excellence in their businesses. These are not the companies from the financial sector that couldn’t have avoided these losses. These losses are a result of their well thought-out decision to hedge the business risk. If you see the notes to the account, most of these companies will claim: “The Company does not hold or issue derivative financial instruments for trading or speculative purposes”. Why are we seeing these losses? It’s important for investors to understand the risk being taken by the companies in an effort to minimize volatility of earnings. The events from all around the world have put a big question mark on the utility of hedging. Let’s understand why these companies entered into these contracts in the first place. Suppose a company produces garments and exports them to the US. The company sources most of its raw materials fromthe domestic maket, so the cost incurred is in rupees. The proceeds of the sales are denominated in dollars. Suppose it takes 3 months to receive the payments on the goods sold. If the dollar depreciates between the moment the costs are incurred and the moment when the customer pays, the company will get less money than it would have got if the goods were sold and paid for immediately after they are produced. The fluctuation in the value of the dollar will cause their profits to go down when the dollar depreciates. The company doesn’t want to shock the analysts who give so much emphasis to quarter on quarter growth. So it enters into derivative transactions that enable it to profit from a depreciating dollar. The company is in the business of garment manufacturing and it has no expertise to predict the direction of the movement of the exchange rate. If it had, it would be better off shutting the garment business and start making money in betting on exchange rates. Dollar to rupee exchange rates have shown no clear trend. In the last 10 years, the dollar has been moving in the range of 40 to 50 rupees. Had the company focused only on its garment business in the last 10 years, ignoring the movement of the exchange rates, its profits would have been lumpy but the aggregate profits would have been higher because there would have been no cost associated with maintaining a treasury operation to bet on the dollar and to pay brokerages on the derivative instruments. The only instance where the hedging will help is when a company is working at a very low margin, say 10%. If it knew that the dollar will depreciate by 10%, it will not produce and export garments to the US because it is a loss making proposition. For this company, it is critical to lock the exchange rate at the current rate and hence it makes sense to hedge the currency risk. But why should companies in software or pharmaceuticals, which operate on 30%+ margins, indulge in hedging? They will still be exporting even when the dollar depreciates by 10% or so. I’m not saying that the concept of hedging itself is bad. But the way the corporations are indulging in speculation in the garb of hedging, I have no hesitation in terming the whole concept as evil and in making a case for an outright ban on hedging. Who says morphine doesn’t have medicinal properties, which when used appropriately can help relieve the pain? But talk about these beneficial properties to drug addicts, they will award you noble prize! Another big reason for the forex losses reported by Indian companies is the external commercial borrowings (ECBs). The interest rates in many countries are low compared to those in India. That doesn’t mean a great opportunity. In a talk, Warren Buffett said that Berkshire can easily raise a 10-year loan at 1% in Japan but he will have to invest the money in something that is yen denominated, because he doesn’t want to get exposed to currency risk. Imagine the investor, who has an enviable record of 21% per annum returns for the last 45 years, refusing to take a 10-year loan at 1% due to currency risk and then look at these idiots from corporate India who went all around the globe with the begging bowls for loans at 6% to 10% that were many many times their networth. What the hell were they thinking? Well, they had hedged their currency risk. If a company has a revenue of one billion dollars from exports and it takes a billion dollar loan, it may think that it is not exposed to any currency risk. If the dollar rises, its revenues will rise and that will offset the rising value of the loan in rupee terms. Any guesses on what can go wrong? What if revenues fall from one billion to 500 million and the dollar rises by 10%? What about the accumulated interest if the bond holders choose not to convert their bonds into equities? What about refinancing of these loans? Corporate India wasn’t thinking about all this. They ventured into even more adventurous pursuits. Suppose a company’s revenues are denominated in pounds and it finds a golden opportunity to raise a loan at cheap rates in dollars. The company goes for the loan and enters into dollar-pound swaps to hedge the risk. Now you have 3 currencies. It doesn’t stop here. The companies which export to all over the world have derivatives denominated in many currencies. When things go wrong, these companies have no expertise in dealing with the complexities of derivatives. And things did go wrong. The derivative losses have become regular and ugly surprises in the financial results in India. I’ve reason to believe that India will be better off banning the ECBs and developing a more liquid corporate bond market within the country. You cannot allow teenagers to carry guns because if they do, they will shoot themselves in the foot and sometimes right in the middle of the eyes. Charlie Munger, Vice Chairman of Berkshire Hathaway, minces no words in criticizing the derivative. To rid Wall Street of its Las Vegas tone, Munger suggests leveling the options exchanges in Chicago and New York, and banning completely all derivatives contracts. It’s not rhetoric. He knows what he is talking about. The risk you are exposed to, does not get reduced if you take counter measures that are dangerous and beyond your expertise. If you are going alone in a jungle full of wild animals, you should NEVER carry a gun if don’t know how to use it, when to use it, when not to use it and finally how to use it well enough to kill in one shot. If you ignore the risks you have hedged, you will soon be wedged. Hedging always involves balancing of two opposite external forces and this is always a daunting task. The more complicated your hedging structure is, the more risk you are taking of collapse of the entire structure. One example is a case where a single factor causes simultaneous strengthening of one force and weakening of the other. This will cause the balance to be distorted. For instance, if you think your dollar revenues are a hedge against the risk due to dollar denominated loans, you are wrong. A single factor, like the weakening of US economy, will cause fall in revenues and at the same time, the falling exports will put the rupee under pressure blowing away your hedge. Beware of what Charlie Munger calls, a lollapalooza effect, created by the confluence of multiple factors working together. If the business was faced against a single risk, it is easy to hedge against it but when multiple factors start contributing to the risk, you may be better off without the false sense of security. As Charlie says: Somebody has to step in and say, "We're not going to do it –it's just too hard." It doesn’t take anything more than common sense to close down your umbrella when the rain is accompanied by storm. You are going to get wet anyway, so why risk losing the umbrella or yourself with the umbrella. But the events prove time and again that common sense is not so commonly observed in corporate echelons. Hedging has both a moral and financial cost associated with it. Every time you hedge against a risk that was just in your imagination, you lose money. Every time you pay money to your financial advisors to help you reduce your risk and to buy the derivatives, you are incurring a cost which can, in the longer run, add up to more damage than the unhedged risks may have caused together. Buying insurance in Black Jack is a losing bet precisely because the house structures the odds in such a way that you always lose money in the long run. But the financial cost is nowhere as big as the moral cost. When you start hedging, you will create a unit in your finance department to handle the derivative contracts. You will not hire a layman but go on to hire a bright guy with an MBA in finance who boasts 10 years of experience at a great financial institution called Lehman. There will be times when the profits from derivatives will be more than the profits from your business. That will be the start of the transformation of your company into a casino. Because you think you have safeguarded against your risks, you will go on to take more and your bright treasury department will enter into more derivative contracts to hedge those risks. May be they will hire more people. It won’t be long before the company will implode. Investors in India are in for even more ugly surprises. The new accounting standard AS-30 is optional till March 31, 2011. While most of the large companies have already started using it, I’ve no idea how many small companies are still avoiding it. The problems inherent in accounting the value of illiquid derivatives will ensure that even when the standards are enforced, there will be ample scope for creative accounting. Munger says, “To say accounting for derivatives in America is a sewer, is an insult to sewage". Oh! I just realized, I’ve insulted hogwash in the title. A caveat: “Business I admire” should not be translated as “Stocks I’m buying” and definitely not as “Stocks I’m recommending”. I generally buy the businesses I admire when they are selling at prices that give me unfairly high chances of making money. If there is one Indian business which, in my opinion, fits the description of what Buffett would would find attractive, it is Castrol. A bit of history. In 1899, C.C.Wakefield started a company in his name, to compete with his former employer, Mobil Oil. (Disgruntled employees are sometime dangerous!). The company started selling automotive lubricants under the brand of Castrol in 1909. In 1919, Castrol setup its only overseas branch office in India and commenced operation. In 1983, the company got listed in India. Before 1991, Castrol India could only make a limited amount of lubricant owing to the quota system. Due to this they focused only on superior products at premium prices. After economic liberalization in 1991, Castrol widened its network and its volume share went up. Today Castrol is major player in the Automotive lubes market and holds a market share of approximately 21% in the overall market. Its parent Burmah-Castrol was acquired by the BP in 2000. After acquisition, Castrol has retained its separate identity. Castrol branded lubricants continue to be sold around the world and are, in many countries, market leaders. Castrol operates in a segment which is a low involvement product for the consumer and it is too much to expect brand loyalty. The company, however, has managed to build a strong brand which was acknowledged as a Consumer Superbrand for in the recently concluded survey by Superbrands India Pvt Limited. The company’s competitors are PSU oil companies(IOC, BPCL, HPCL) which have their own lubricant brands. These companies together own more than 90% of retail network for retailing petroleum products. Despite that Castrol has managed to out compete the PSU brands and that speaks a lot about the strength of company’ products. Castrol is not immune to downturns. The key raw material in making lubricants is base oil whose is derived from crude oil. The spurt in base oil prices increases the cost for materials. The company has strong brand to be able to pass the cost to the consumers but its competitors are PSUs whose business decisions are often driven by political compulsions and they have often resorted to unprofitable pricing. In year 2000, the net profit of Castrol fell from Rs 204 crore in 1999 to Rs 108 crore in 2001 when PSU oil companies did not revise their product prices despite increase in base oil price. Castrol recovered later and its profits went up from that level to 262.3 crores in year ending December 2008. The revenues doubled in the same period. As the PSU companies started losing money retailing their petroleum products, they have avoided price wars in lubricant market. The company has managed to increase the prices of its products without affecting the volumes significantly and the margins have remained around 20%. With drastic fall in crude prices, the base oil prices are expected to follow suit and the company will see reduction in cost of materials. Another reason to worry is the decline in the volumes. Commercial Vehicle Original Equipment Manufacturers (OEMs) have made changes to their recommendations on oil drain intervals i.e. the distance traveled before oil change. Tata Motors introduced new oil drain specifications for their Heavy and Medium Commercial Vehicles for both crankcase (Engine Oils) and transmission Lubricants. The engine oil drain period has been doubled to 36000 kms while the transmission oil drain intervals have risen to 72000 kms. These specifications will reduce the engine oil consumption per vehicle which will translate into lower volumes for Castrol. So much for the bad news. Despite all this in the long run the economics of this business are quite attractive. The market size of automobile lubricants is a function of the total number of vehicles on road and does not vary as much as the annual vehicle sales figures. Mathematically, a sum of a timeseries will have lower volatility compared volatility of the series itself. This results in slow and steady growth for lubricant market. In India the total number of vehicles on road, will rise at a decent pace in coming decade. The emergence of small low cost cars, decreasing size of family units, multiple car ownership, rising incomes and improved infrastructure are all going to help increase the car ownership rates in India. At the same time, Indian people have high levels of emotionally attachment with their cars. This helps in warding off commoditization of the lubricants. In commercial vehicles and industrial segments the market is already commoditized. However, the customers believe in the superiority of Castrol products and the value proposition helps the company in retaining its market share. Castrol goes a long way in trying to build a bond with customers. In 2006, it started Castrol Bikezone a chain of multibrand two wheeler service centres. Although Castrol would like to see it as a growth area but I’m not too sure about thus. Still it’s a better way to get close to your customers rather than spending your marketing dollars in sponsoring cricket tournaments. Time will tell whether it turns out to be a good move. Perhaps investors understand the strength of Castrol. That is why Castrol’s price hasn’t fallen at all in this downturn. At 309.7 Rs, it’s selling at 14.6 times its profits and 6.2 times it’s estimated book value(FY 2008). The valuations look high but look at the figures closely. Castrol earned 262.3 crores, when its networth at the beginning of the year was 475.5 crores. That too without any debt. This translates into 55% return on networth. In hasn’t diluted its equity for years. In past 5 years it has paid back as much as 75% of its profits as dividends. Last year it paid 15 Rs as dividends which gives you 4.84% dividend yield at current price. The only reason I hate Castrol is that it refuses to fall. I bought the stock at Rs 235 in January 2008 and sold it at 330 nine months later when all others were falling like nine pins. I must admit that I violated my own principles while selling it in the hope to buy it back cheaper but that opportunity has eluded me so far. Hopefully, sooner than later, I’ll admit my mistake or Mr. market will come to redeem me.